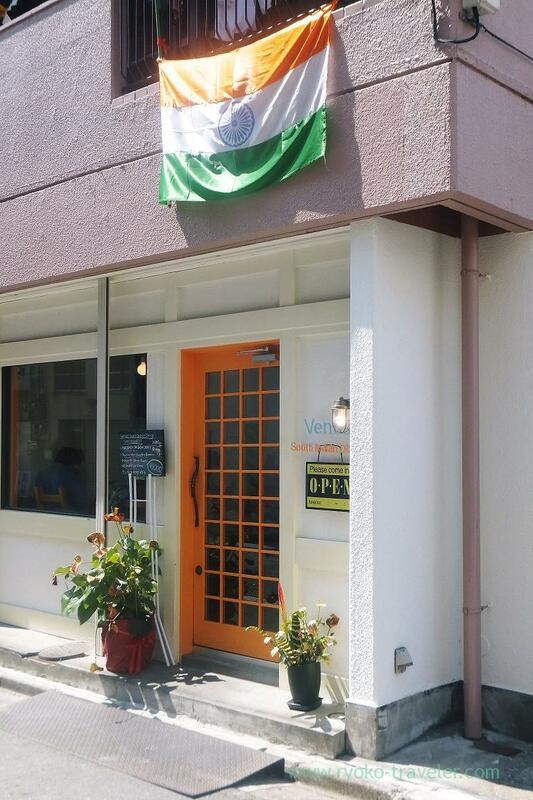 South Indian Dining VENUS that is open recently in Kinshicho area. I enjoyed the restaurant a lot at dinner time the other day, so, I tried to have lunch at there. Ah ! the flag is getting loose ! I had heard that they serve meals set at at lunchtime. But they seemed to change their system. Four types of curry, naan, rice, salad and dessert is served on the long table. I had no idea how to dish them up…. so I hate buffet ! My dish show me that I had no taste ! Anyway, I picked egg curry, chicken curry, beans curry, rice, naan and salad on my plate. Those curries were quite spicy ! 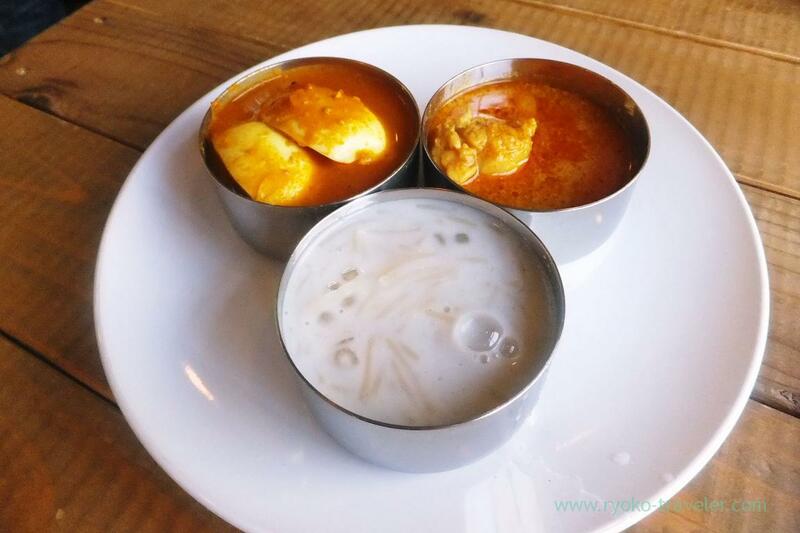 I like the egg curry best. Half-boiled eggs were in the spicy curry. Curries in warmers were not very hot, so, eggs remained half-boiled 🙂 I like rare yolk ! Well, I have another reason why I don’t like buffet. Foods get cold in warmers. 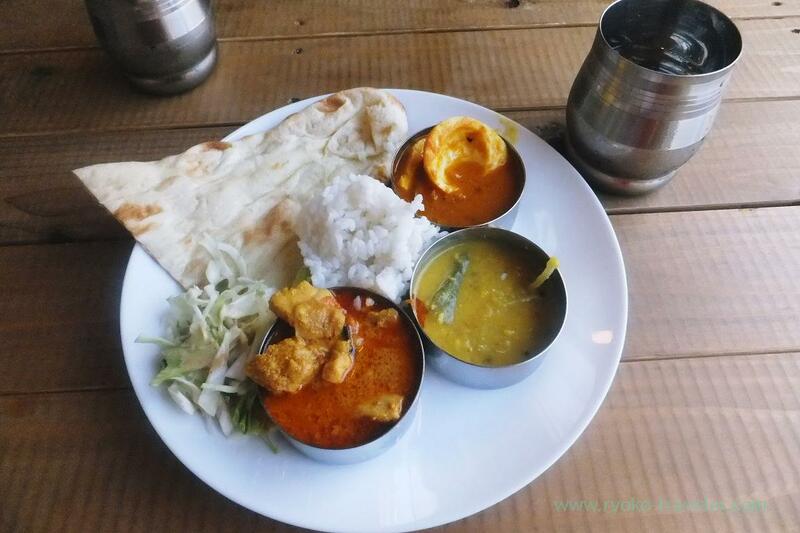 Rice and naan got cold..
My friend who already had second helping while I was eating foods on the first dish said to me, “Now, naan and curries were hot !”. But I couldn’t because this first dish made me nearly full. But I wanted to have second helping of curry all the same. So, I just had second helping of curries. (Without rice, naan). I had it as soup 🙂 And dessert. Those were tasty, but I want them serve lunch set again….